Being a football hipster is serious business with knowledge about the young starlet making waves for a non-mainstream mid table side often a prerequisite rather than a feather in the cap. To further enhance your, perhaps, burgeoning reputation as a true hipster, Outside of the Boot is on hand to provide an in-depth guide to some of the less celebrated teams around Europe. In this edition of the series, Hamoudi Fayad has a look at Leverkusen. 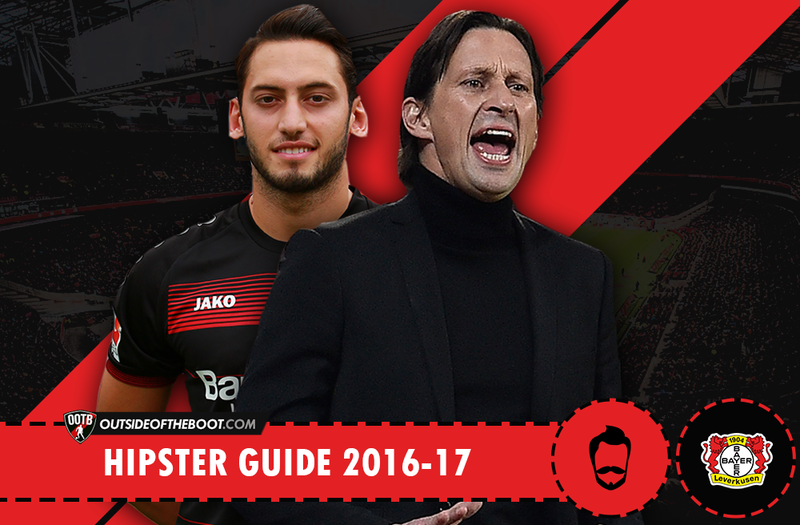 Bayer Leverkusen have been one of Europe’s teams to watch since the arrival of Roger Schmidt at the helm back in 2014. A 4th placed finish in his debut season was followed by a 3rd place spot in the 2015/16 edition of the Bundesliga, where they challenged the likes of Borussia Monchengladbach, Hertha BSC, Schalke and Mainz to power through to 3rd place from 8th place in the last 8 weeks of the season. Yet despite their better placed finish, the season had many downs that could’ve saw Bayer take away a trophy by the end of the season. The Europa League had taken its toll on the players by the post mid-season period. Taking into account the team’s general tactical approach, the amount of injuries they had suffered from is not a surprising figure. Only Karim Bellarabi, Wendell and Bernd Leno stayed fit for most of the season. 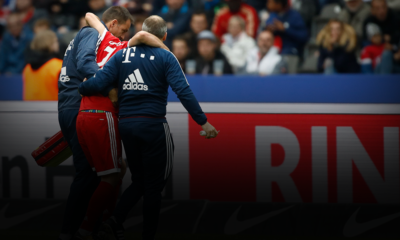 The loss of Omer Toprak, Kevin Kampl, Lars Bender, Christoph Kramer, Charles Aranguiz and Kyriakos Papadopoulos were too much for the team to handle, especially after the ban Roger Schmidt received due to his actions in the match against Dortmund. An issue of scoring goals outside the man himself Javier Hernandez was evident with the player scoring more than double what his closest teammate racked up, Karim Bellarabi (12), with 26 in all competitions. Roger Schmidt was previously known for his time at Red Bull Salzburg where he led the team to a double in the 2013-14 season. His tactical style is certainly one that catches the eye, with his preference for high pressing, counter-pressing and verticality leading to Bayer Leverkusen becoming one of the tougher teams to face in European football – barring that period of ignominy last season. He truly is a passionate manager, but comes with his flaws like anyone else. His reluctance to change views on his tactical approach is one with the other being his cantankerous, uncooperative self on the touchline. The third season in the relationship of Schmidt and Bayer could be a make or break one. On one hand, Leverkusen finished in the top four once again under Schmidt. However, his 3-week ban and tactical intransigence left the club almost searching for a replacement. Can he successfully turn the team into a title challenger? Bayer Leverkusen, under Schmidt, are known to be one of the most pressing-addicted teams in European football in recent years. In fact, over a year ago I had written an article on the pressing system of Bayer Leverkusen in their first few months under Roger Schmidt, highlighting each aspect of the pressing and their triggers. 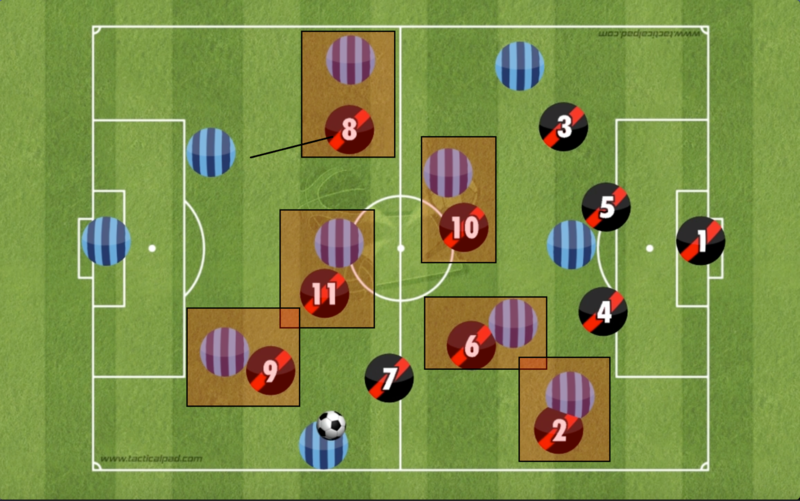 Bayer Leverkusen focus on a number of key principles that lead their structured pressing. Structured in a sense that each individual player knows where they have to be during each pressing trigger, relative to the team shape. Let’s take a look at how they’ve adapted and improved on their pressing structure more than a year after Schmidt’s arrival, especially with the addition of new players such as Kevin Kampl and Javier Hernandez, plus the rise of Julian Brandt on the left hand side after the departure of Son Heung-Min. Cover shadows, horizontal compactness and touchline pressing. These three ideas are all applied in tandem during Bayer Leverkusen’s matches to win the ball. The use of cover shadows is beneficial in the sense that the presser will be killing two birds with one stone: his direct opponent and the passing lane that leads to another opponent. Leverkusen’s consistent use of the 4-4-2 / 4-2-2-2 means that, rigidly, they will only have two central midfielders to protect the heart of the pitch. Schmidt has developed ways to battle this, with one of them being the cover shadow. Horizontal compactness allows Bayer to concede less space in the centre and halfspaces, supporting both central midfielders and the central defenders who don’t have a designated defensive midfielder sitting ahead of them. This is where individual responsibilities are deemed important, only if they benefit the overall team structure. In turn, this produces space on the flanks. The space conceded on the flanks is preferable because the opponent will only have 180 degrees to turn and not 360, thanks to the existence of the touchline. Leverkusen often have a 3-2 or 3-3 formation on the flanks, with one player pressing backwards (ball-near striker), one player pressing from midfield (ball-near CM) with an indented shape that forms a triangle rather than a line, and finally one player pressing from the front (winger or full back). This is quick, structured and most importantly effective. An example of Bayer Leverkusen’s pressing against Porto, a 3-man pressing front with access to each and every single player on the pitch excluding the goalkeeper. Their marking and pressing is largely based on man-orientations but they can shift and co-ordinate as a team which is what makes them so dangerous in the press; largely due to their patterned training under Schmidt. Notice the ball-far winger who is slightly indented to encourage connections and an option out wide should Leverkusen recover the ball. In terms of the offensive phase, Leverkusen like to play a risky game based on verticality. During the game, there is usually a player who plays off the main striker. This could be Hakan Calhanoglu, Stefan Keissling or Admir Mehmedi. Their job in the possession phase is to either drop slightly deeper or move ahead, usually to the ball-near halfspace to support combinations and give the players vertical option in a strategically beneficial positon. Build-up wise they could use the full backs to help the centre backs, or the defensive midfielders (usually Kevin Kampl) would move into the halfspaces to receive the ball diagonally and be in a position that helps them move the play from their own half quickly. The double pivot provide the necessary structure to compensate for any failures in attack, to attempt controlling the transition phase. Bayer Leverkusen have replaced the outgoing Christoph Kramer with Austrian Julian Baumgartlinger, who had a stellar season with Mainz and moved to the club for a fee of 3 million euros. The big signing has come in the form of former Hoffenheim forward Kevin Volland, who gives Leverkusen new options across the pitch. Likely to operate in the deep striker role next to Javier Hernandez, Volland may also deputise for Bellarabi from the right flank offering a different attacking direction with his proclivity to cut inside and work in the halfspaces. His pace will be of good use should he be adept with it during pressing phases while also possessing a more collective mindset to be able to transition from defence to attack seamlessly. Aleksandar Dragovic looks set to come into Leverkusen’s ranks instead of the potential Stoke City player Kyriakos Papadopoulous. The former’s positional sense and awareness could be the ideal partner for Omer Toprak. Javier Hernandez: B04 struggled with goals in the season before Javier Hernandez signed, with only Son Heung-min and Karim Bellarabi scoring over 10 goals in the league (11 each). Javier Hernandez went on to score 17 in the league only, with another 9 in all competitions. Even with the man himself, the rest of the team failed to produce anywhere near the expected tally to lessen the load on Chicharito. His seemingly great positional sense that allows him to beat the offside line, his ability to run behind defenders and receive the ball in the box – subsequently scoring despite the pressure surrounding him – and mostly his poacher-like goals were all the makings of his successful stint at B04 up until this summer. Occasionally, Chicharito would move from outside the box, take on players and score from outside of the box. His play was nothing but one-dimensional and he proved that he was more than just an effective striker from off the bench. Hakan Calhanoglu: Arguably the most talented player at B04, it looks like free-kick master Hakan Calhanoglu will be staying at the BayArena. Playing off the striker or operating in the double pivot are possible zones for him to initially play in, but Calhanoglu is usually stationed out on the left. Calhanoglu is also vital to any chance of Leverkusen attaining another spot in the Champions League for the coming season. Calhanoglu more than just produces wonderful performances from the set-piece stage, but he is a great playmaker. Moreover, for what he lacks in speed and strength he makes up for with tenacity and hunger in the press. He suits Schmidt’s system and is of a rarer mould of playmakers; playmakers who will put in a shift for the team. Calhanoglu, however, like everyone else in Schmidt’s line-up, is only “one of 11 players and our strength is the whole team”. Calhanoglu’s collective duties are what makes him stronger as a player under Roger Schmidt. Kevin Kampl: Another creative presser for Bayer Leverkusen, but one who works in deeper locations. A versatile player who has worked under Schmidt before at RB Salzburg, Kampl’s capabilities include playing on the wing or dictating play from deep. 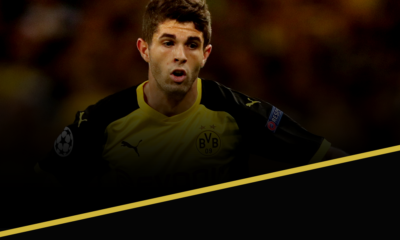 He has been a key player for B04 and after the departure of Kramer he is expected to marshal the midfield. The only issue in the 2-man midfield Kampl was part of in the last season was the team’s inability to stay vertically compact, which led to disconnections and underloads against the opposition. The front four would often push ahead too far ahead of the double pivot which would leave them effectively stranded and prone to transitions, which German teams are known to be deadly for. Kampl’s importance to the team, like every other player, relies on the collective duties of the team. 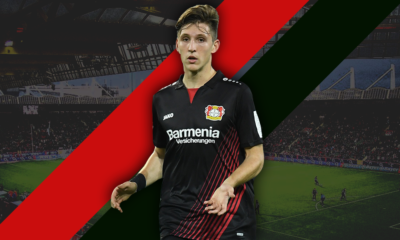 He may perform well in terms of dictating tempo and spreading the play but without the adequate supported and collective positional play to strengthen B04 in both phases to help control the transition, his influence on the game will be hindered. Julian Brandt: A player whose consistency has become important to Bayer Leverkusen’s success, the 20-year old is set to become a breakout star in the Bundesliga over the course of the next few seasons if he continues on the same path. At a certain point last season, he had scored in 5 consecutive games; no mean feat for a young winger in the Bundesliga. Intelligence off it and agility on the ball are two of his best attributes and there is no doubt that his height for such a young winger gives him the aesthetic edge over the full backs. However, in football, nothing is played on paper, luck or an advantage in physical ability. He lacks the explosiveness that Karim Bellarabi brings to Leverkusen’s game and his pressing isn’t yet up to the standards of Roger Schimdt’s grueling system. With B04, you never know. If they’re able to shun the curse of injuries, they might as well challenge for honours. But the mid-week games and potential Europa League entry could be a factor to ruin their season yet again. 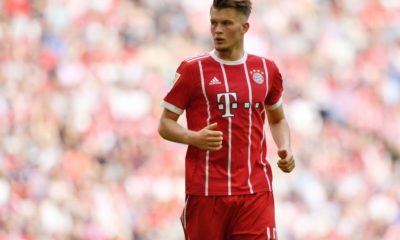 The players have adapted to Schmidt’s system and it seems that this summer has been all about upgrading the weak links, rather than an overhaul of the squad such as one that saw 7 in and 7 out during the summer of 2015. Watch out, Bayern and Dortmund?